Passengers found a live snake during a flight between Torreón and Mexico City. A massive snake dropped from the overhead compartment and scared the living daylights out of everyone. Nobody was hurt, and the flight landed safely in Mexico City where workers contained the snake. 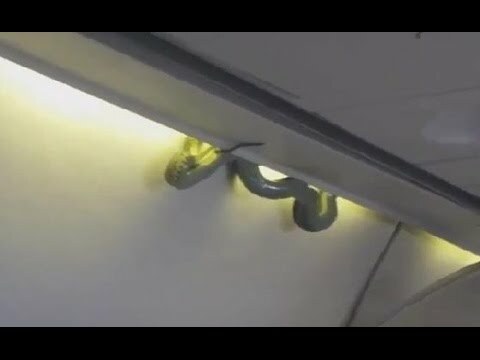 In a video posted online, the green snake can be seen inching along near an overhead luggage compartment before slipping and dangling from its tail, scaring passengers. Aeromexico said air traffic controllers gave the plane, en route to the capital from the northern city of Torreon, priority to land after the snake was detected, but it was not considered an emergency landing. The snake was believed to be a venomous green viper, and the airline is investigating how the snake got onto the plane.